Whether you’re playing ESO on PC/Mac or awaiting the game’s console release on Xbox One and PlayStation 4, we’ve got some big news to share! 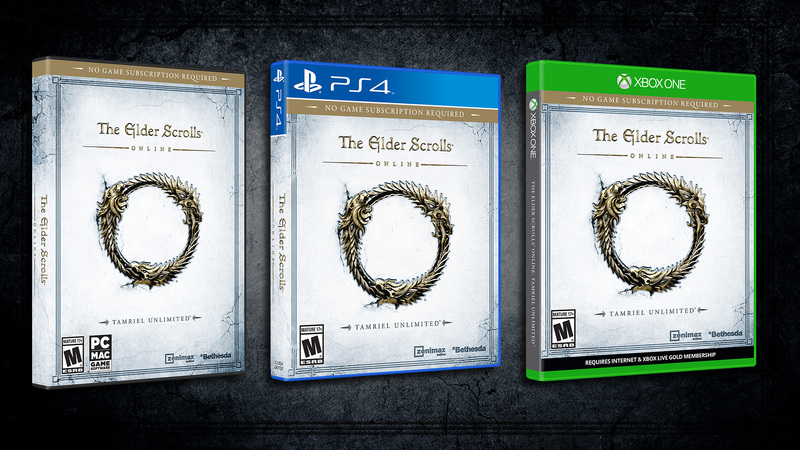 Beginning on June 9th TES fans on Xbox One and PS4 will be able to endlessly explore The Elder Scrolls® Online: Tamriel Unlimited! This edition of the game features all of the gameplay from the original PC release, including all the new content and changes made over the past year, and it comes without requiring a monthly game subscription fee! And for our PC/Mac fans, we’re pleased to announce you’ll be the first to experience this new way to play ESO – beginning on Tuesday, March 17th! In Tamriel Unlimited, you’ll be able to purchase optional downloadable content, and the in-game Crown Store will offer convenience and customization items. Already a subscriber? You’ll become a member of ESO Plus to receive monthly in-game benefits and a monthly allotment of Crowns to spend in the store. Our team remains committed to providing a great experience to all players, and you can expect continued, regular updates free of charge in addition to our new store offerings. In celebration of these two big announcements, we’ve released the final entry in our four-part series of cinematic trailers, The Confrontation. Enjoy it in the embed above! For more on ESO, including information on the changes coming with Tamriel Unlimited and additional info on ESO Plus, visit the game’s official website FAQ– www.elderscrollsonline.com/faq, and don’t forget to tune into our special edition of addition of ESO LIVE today at 12pm with Pete Hines and the ZeniMax Online Studios team on Twitch.TV/ZeniMaxOnlineStudios. The discussion continues after this sponsored message. Tired of seeing advertisements? Create an account to remove them.